A: More commonly, you should look for a food that is grain & corn free, has plenty of enzymes and probiotics, and a good source of protein. Typically, unless you have a rare case of an active bulldog (a skateboarder for example), you want to feed less cups per day than what is recommended on the bag by half, and definitely want to reduce the protein intake. Grain & corn free is best for most bulldogs. With much study and investigation, we have found what we think are the best dog foods on the market for bulldogs. Click the link below to view our Top 5 Foods, and more importantly, WHY we choose these foods. Q: I see the food I am feeding is rated only 4 stars. Should I get a higher rated dog food? A: Not necessarily. The rating above are basted upon all dog breeds. Bulldogs are different, so in some cases a 4 star food will do better with your bulldog than a 6 star food. But I would recommend that each dog owner at least TRY a higher rated food before you make that decision. Q: I cannot find my dog's food on this list. Why? A: If your dog food is not listed then it was not graded prior to April of 2010. But send me a message and I will gladly look at it for you. Or read our article on how to read dog food labels and finding bad ingredients BY CLICKING HERE. Q: I still have half a bag of my old brand of dog food. Should I wait? A: You should spend a minimum of 4 days switching your dogs food over to the new brand anyway. But I recommend a week or even longer. Here is why. Bullies have very sensitive tummies and you really must do it slowly. Even putting them on half and half for a week can be better. Start by slowly introducing the new food into their diet, a little more as each day passes, until you get them on the new food. If you switch directly from one food to another, your bully could experience any of the following: Severe Gas Pains, Diarrhea, Vomiting, or Lack of Appetite. Q: Switching dog foods sounds expensive!! I have seen the prices of those dog foods and they cost 3 times more than what I am feeding. How can I switch when I am on a tight budget? A: You probably will not believe this- but it really isn't very much more. If your dog is currently eating a 1 star food, it is full of fillers and does not have the nutrition or quality that the higher graded foods do. You probably give them 2-4c a day. When you switch, you will need to cut the intake of your dogs food by at LEAST half, 1/2c to 3/4c twice daily is all your bully will need to be healthy & fit. You can give them some carrot sticks, frozen green beans and healthy snacks. Q: I have never even heard of these 5 and 6 Star Dog Foods, why? A: I added this question specifically because that was what I personally could not seem to get through to my very own brain! The dog foods you see at Petsmart, or the in the grocery store, or advertised on TV don't put much cost into making their foods. They are paying for advertising. Look at the #1 ingredient in Purina for example. Corn. #2 ingredient. Wheat. That means the two worst foods for a bulldog is what most of their diet contains. High quality foods don't put all that money into advertising, it goes into the food. They depend on word of mouth advertising. Great article, not only for newbies, but like me when I joined and Vegas was a year old eating Iams and was a mess. I wish I could have ran across an article like this then. 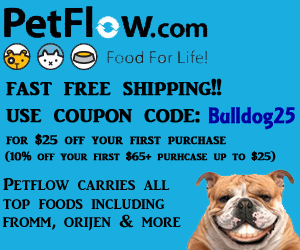 Why oh why does Petflow NOT carry Nature's Logic? I think I will finish this bag out then I will look into something for Orion that I can order from Petflow. I will ask for recommendations when we get her switched over completely and we start seeing or not seeing results. How much protin is too much !! trying to do all of this for all of US!! this is what you NEED to keep in mind when looking for Bulldog food!!!! we all KNOW that Bulldogs are the MOST susceptible to allergies of any breed out there. AND they are totally different than ANY other BREED!!!! not only does it make a difference what the quality of the MEAT & and grain is,, that's in the food, it is also how it is made. what makes any one think that the ratings in the dog fancy books ,or any other food rating ----remotely pertain to BULLDOGS ???? because they DO NOT!!! !there are 2 to 3 brands over the years until lately that have kept bulldog healthy !! forget all the advertising on TV --if they have to advertise--there is a reason!!!!! it is to fool you into thinking it looks good to you !! no company will spend that kind of money unless the must!!! two brands have been tried and true -((-Natures Variety and Merricks.)) and even the have been gobbled up by big pet food companies!! there are 4 t 5 in the USA ---that's all. and every brand is under those few companies. and those two , Natures Variety,and Merricks,have not stepped up to include a good yogurt type culture,and put a guarantee on it !! we all know pre and pro biotics are the thing t help the digestion and immune system !! there are only 2 COMPANIES that do this, AND use only grade A--muscle meat(muscle meat is the roasts, and prime cuts we buy in the grocery store))IF it doesn't say human grade MUSCLE MEAT it ISN'T and will be coming from the rendering plants !!!! human grade just means that a human might eat it !! !BUT it is not prime cut muscle meat!! ((FROMM,)) and (((Great 4 Life))are the ONLY 2 who do ,and guarantee it in writing!! you can take that to court!!! they also do not use ORGAN meat--the heart,kidneys,liver,stomach,lungs.THOSE can give a dog stones because the minerals are to high ! now there is nothing wrong with the other foods if you don't mind the meat being by products from a rendering plant !! many dogs do just fine, there is protein in a hide off a cow, or hooves,head contents, as well as stomach contents!! and these are whats used from the rendering plants for pet food. but this is where you will get that smell that emanates from the skin off of a dog. or smell the bag of food you just opened-you can smell the grease/fat !!! it is not a pretty picture! but it is a fact! there are many videos that you can watch to see just what is in the normal dog food! and I am sorry if this is a bit graffic, But it is the truth!! I am tired of advertising fooling people to show what they want you to believe is in the food, and do not fall for the extra coating on dog food--if that is done it is because they have cooked all the goodness out ,,so that the dogs could digest it!! and that is being hydrolyzed !! which causes harm to dogs! !but it makes it easier for them to digest it ! I think I have heard everything from extra goodness of a coating of plasma! to enrich the food -to this years word that is REAL--- a few years back it was natural, and before that it was organic! this year the word is real -well folks we are not that dumb! quality MEAT,then a QUALITY GRAIN,and then good veggies and fruits, along with a natural,combined with top notch US vitamins, makes a good food. the yogurt (live culture of course) is all we need to have long living healthy dogs. and we all know that if it is good enough for a Bulldog--then its good enough for any breed. he sometimes only had 1 BM a day- so think about COST a 30 lb bag of FROMM does one dog for 4 months(if measured) that is about $10.00 a month to feed your dog. HOW MUCH ARE YOU SPENDING NOW.???? and how much waste is in the yard???? not to mention everybody is adding supplements to their dog food!! there is no need .Fromm has the pre and pro biotics in it already!! you will see 99% of all allergies go away, tea stains gone, no inter digital cysts in the toes,no yeast infections in the ears. I haven't had that trouble in years. just simple good food!! thank you for reading this , and I wish all of you a healthy happy dog. I need help choosing a dog food for Tonka. We started out with wellness puppy food till a little over 12 months, tried wilderness, the vet thought he was having a reaction to it due to his jowel being a little red and some bumps on his lip and his chin. We went back to welness, super5 mix and now he is back to having soup for his poop.. He is also soooo fussy, so I read and put a little cottage cheese to his food. NOW he doesnt even want to eat that!!!! Need to change his food again but unsure what to go with..... He is a prince and yes is way over spoiled! Could this also be an issue, me spoiling him? I recommend doing a blood allergy test first. You will get a list of foods he's allergic to and they also give you a list of dog foods he can eat. This is where your homework starts. Eliminate all the low rated foods and stick to the 6 star ones. Not all dog foods are on there so you can look up other choices and I would double check the ingredients on their company websites. My Mr. Wilson is a tough one because I've only found three or four he can eat but at least he doesn't have bumps and scabs on his skin anymore. He just has grass allergies now makes him have itchy paws and eyes so I have to wash his paws a lot and wipe his face. Not all vets do the test. Surprisingly my bully vet does not and I had to go to my secondary vet to get it done. Glad I did because I found out he was allergies to lamb and potatoes and he was on a food that had both listed as ingredients. thank you. i may have to try to find a new vet, i need one with more knowledge about my dog. At his last check up when i told her that I switched and asked for advice, she didnt really have any for me. They wanted me to try purina pro plan, i KNOW this isnt a good food for my boy. Any suggestions for a vet in the concord nh area? The breeder that we got Tonka from brought his dogs up north but also told us to use purina...... I thought that the old english didnt have as many allergies, which im finding out, i was incorrect in this thought. Boy vets never cease to amaze me about dog food recommendations! well that is the question with bulldogs what to feed. why dont you try fromm. its good food and lots have success with the beef fritatta. my dogs dont want to eat unless i put just a smidge of canned food over their dry. maybe try that. also earthborn holistic has had success here to. not sure how old your pup is but if its over 4 months then these are good choices.